Point In good condition could do with a clean. Point needs fish plates. We are enthusiasts and modelers who have successfully turned our hobby into our livelihood. Box has slight wear, point is perfect. R/H Elecrofrog. Nominal radius:508mm, Angle:10 degrees, Length: 160mm. PECO STREAMLINE FINESCALE CODE 75 ELECTROFROG MEDIUM RADIUS RIGHT HAND CONCRETE SLEEPER POINT. 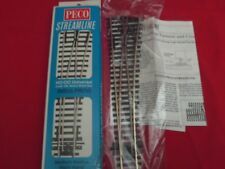 PECO OO GAUGE - MEDIUM POINTS TURNOUTS X 4 UNBOXED USED. Working condition. Dispatched with Royal Mail 2nd Class. L/H Insulfrog. Nominal Radius:914mm, Angle: 12 degrees, Length:219mm. We will always help you to have a 100% positive happy buying experience. Our Code: PESL-96. Part Number: SL-96. For more details on Electrofrog turnouts, see our Wiring the Layout publications Nos 4 and 21. Code 75 finescale electrofrog. Nominal radius: 914mm (36in) Angle: 12º Length: 219mm (8 5/8in). OO gauge Code 100. 80 thou (.080") 2.0mm thick clear plastic card. Expo 73545 No.234 Razor Saw Blade (fits X-acto). Deluxe Materials AD25 Scatter-Grip Tacky Glue. R/H Insulfrog. Nominal Radius:914mm, Angle: 12 degrees, Length:219mm. We will always help you to have a 100% positive happy buying experience. Our Code: PESL-95. Part Number: SL-95. Add to favourites. R/H Insulfrog. Nominal Radius:914mm, Angle: 12 degrees, Length:219mm.